Time for some baking at The Home Bakers (THB). For our bake no. 8, Yvette form My Worldwide Culinary Adventure has chosen a savoury bake, Sun-dried Tomato-Pistachio Polenta Cake. 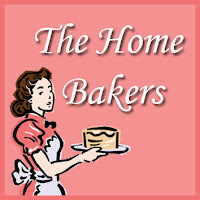 I would like to extend my appreciation to Yvette, as she has been busy these few months and have not been blogging much, but she is so gracious as to have taken the time to join in and host this week's bake at THB! Thank you, Yvette! I am a great fan of cornbreads. So I was looking forward to bake this version. Now this recipe calls for sun-dried tomatoes and I happen to have some in my fridge. My homemade sun-dried tomatoes was made many months ago and they keep really well stored in an airtight container in the fridge. I did not soak them in oil, as at that time I wanted to use it for something else, but well...it has been sitting in the fridge since then..!! haha! These are great as a snack too, tangy and sourish, yum! I just need about 2 dried tomatoes for half a recipe, but I used 3. They are cut into julienned strips and soaked with 1-1/2 tablespoons of hot water for about 5 minutes or so, as required in the recipe. I made half a recipe and baked in a 7" round cake pan. This savoury cake, or rather cornbread, uses honey, dried basil, dried oregano, cornmeal, olive oil, yoghurt, pistachios, sundried tomatoes and Parmesan cheese. I use Cheddar cheese instead. While this bread is being baked, it smells incredibly delicious with the unmistaken smell of pizza! My son thought I was baking pizza! I scattered the top with more cheese and pistachios than the amount calls for. I baked for about 25 minutes, left it to cool for about 20 minutes and sliced a piece to try. It has the right level of moistness, I love the tangy taste of the sun-dried tomatoes, the nutty pistachios, and the wonderful aroma and taste of the herbs. The cornmeal contributes to the fine crumbly texture and gave a lovely golden colour to this savoury bread. If you are not a fan of savoury bakes, then you might find that this is not your cup of tea! I am actually looking forward to all the other reviews from my fellow bakers, it would be interesting to see the others take on this savoury bake. The next morning, I sliced the leftovers about 1/4-inch thickness, and toasted them for breakfast, with a cup of black coffee. They are really delicious toasted, similar to eating a savoury biscotti, only a little more crispy soft, with a "herby-cheezy" fragrance. 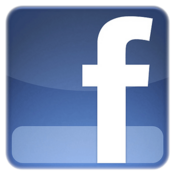 Please stop by Yvette from My Worldwide Culinary Adventures for the recipe and to see the rest of my fellow bakers' bake on this cake, please visit The Home Bakers (THB). I will be away for just a few days, going for a short holiday with my family!! Yipee!!! Will be back visiting you soon! 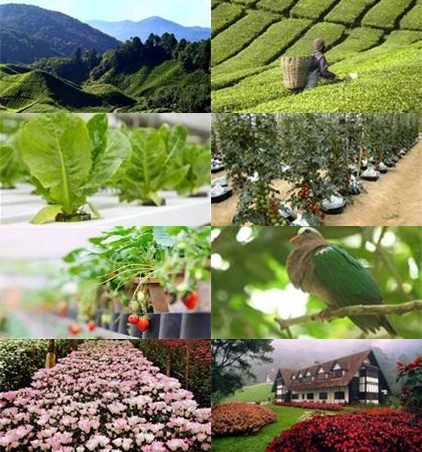 Tea Leaves, Farm Fresh Veggies, Strawberries, Rose Jam, it's all at Cameron Highlands! The mention of Nyonya food, spicy, mouth-watering dishes comes to mind. One tend to think about all the spices and chillies that requires tedious and hours of preparation when it comes to homecooked Nyonya dishes. Well, we do have simple dishes that do not require hours of preparation, and this is one of them. Ikan Goreng Asam (Fried Fish with Tamarind Paste) is an all-time favourite. My beloved late mom used to cook this with the head and skin of mackerel fish, it truly is delicious. She will use the meat of a whole mackerel to make into fish-ball paste, which are then used to cook a pot of Nyonya Fish-Ball Soup with Cabbages and Glass Bean Threads, (I'm drooling just thinking about it! ), and the head and skin of the fish are marinated with tamarind paste and salt, fried with a little oil and thus became another dish, that my siblings and myself truly love! Since the skin is really very little actually, we would share among ourselves and usually the youngest gets more! You may have heard or even cooked the more famous version that is, Tamarind Prawns, which can be found in most Nyonya Cookbooks. Try it with fish, especially when you can get really fresh mackerel, though other fish can be used, but my mother had always used mackerel (ikan tenggiri) for this dish. Even my kids love this Nyonya fried fish. Tip when frying, do not fry over high heat as the tamarind will burnt and turn black rather easily. When frying the fish, make sure the heat is medium-low and fry just until the fish is cooked and still moist. This way, you would enjoy the taste of the tamarind and the moist sweetness of the fish. You would not want a crispy and dry fish, with burnt tamarind. This is the tamarind paste that I used. Sometimes I used the tamarind with seeds. In those days, we do not have seedless tamarind paste like this, my mom used the tamarind with seeds, which are then added with just a little water and mix with the fingers to extract out the tamarind pulp from the seeds for a thick paste or more water for a diluted and thinner tamarind paste. Sometimes, we would eat this fish with some sambal belacan as a condiment, but the kids love it as it is, eaten with rice. And if you do not mind this, drizzle some of the oil retained from frying the fish, over the hot fluffy rice, and eat with a piece of the fish, truly delicious. This is really a simple and very easy dish. I hope that you would give it a try, as I am sure that your kids would love this! I'm submitting this post to Malaysian Food Fest, Melaka (August) hosted by Yummylittlecooks and organized by Wendy of Table For 2.....Or More. Rub tamarind paste all over fish, with some salt to taste. (If using tamarind seeds, add about half to one teaspoon of water and use fingers to rub the seeds and extract out the pulp). Keep aside for 15-20 minutes. Heat oil in wok or non-stick saucepan. Over medium-low heat, fry fish on both sides until cooked, about 4-5 minutes per side, depending on the thickness of the fish, but not crispy. Fish should be moist inside. Dish out to a serving plate and drizzle some of the oil from the wok over the fish. Serve hot. Enjoy! This week is "Potluck" week at I Heart Cooking Clubs (IHCC), where we are currently cooking from chef Rick Bayless's recipes. I have bookmarked more than a dozen recipe of Rick Bayless's to try all these months and this Sweet and Spicy Shrimps is one of them. This is so easy and quick to cook, and most important, this is delicious! The recipe calls for Frontera Chipotle Salsa or Frontera Guajillo Salsa, I do not have either of these. What I have was some leftover La Costena Chipotle Salsa (chunky) and another bottle of Chipotle Salsa (paste). The recipes requires the salsa to be pureed in a blender and press through a medium mesh strainer. Since I have only about 1/3 bottle of the chunky salsa, I pureed that and mix with about half a bottle of the other chipotle salsa (paste). I did not bother pressing the mixture through the strainer. The recipe uses honey to sweetened the sauce, I added in a couple of tablespoons of honey and I still can't taste the sweetness at all, so I added in about 1 teaspoon of sugar, and it was perfect. Sweet and Spicy Shrimps, just as it is called, it is sweet and spicy, though for me, the spiciness is rather mild. The tastes all blend together really well, sour, sweet, salty and spicy. An easy and quick dish to put together and delicious too! I had this with some white rice, and it was good! The taste is similar to our local sambal, only less spicy. This is linked to I Heart Cooking Clubs (IHCC), where we are cooking from Rick Bayless's recipes. Puree the salsa in a blender and press through a medium mesh strainer into a bowl. Heat the olive oil in a large skillet (I prefer a 12-inch non-stick skillet) over medium. Add the salsa and cook, stirring frequently, until reduced to the consistency of tomato paste (it should have reduced enough for the oil to have risen, leaving a sheen on the surface), 3 or 4 minutes. Remove from the heat and stir in the vinegar. Taste and season with honey and salt, it should taste slightly salty and have a hint of sweetness. Stir the shrimp into the cooked salsa (there should be just enough to coat everything lightly) and return the pan to the medium heat. Cook, stirring constanly, until the shrimp are just barely cooked through (cut open a shrimp to see that it has turned from translucent to opaque white), about 3 minutes. Scoop onto a platter and let cool to room temperature. In a small strainer, rinsed the sliced onion under cold water and shake until nearly dry. Sprinkle over the shrimp along with the cilantro leaves, and the dish is ready to serve. It's time for our Bake-Along! Our baking buddy, Zoe of Bake For Happy Kids has chosen Whoopie Pies for our theme bake. I have not made Whoopie Pies before this and it has always been on my list of to do. Thanks to Zoe for chosing this for our Bake-Along. These Whoopie Pies are delightful and we really enjoyed them, a lot! Even though I can find lots of recipes of various Whoopie Pies online, I was really surprised that out of the many cookbooks that I own, only one of my books has a recipe for Whoopie Pies, and that book is Rose's Heavenly Cakes. But when I was browsing thru Bon Appetit's website, this Whoopie Pies with Mint Filling looks good, so I made this instead. And my daughter loves anything with mint and chocolate! The original recipe calls for extra chocolate ganache over the buttercream, but I chose to omit that. And one of the ingredients for the buttercream is egg whites, and I omitted that as well. I am not a fan of raw eggs in bakes, and the minty buttercream is extremely good without it. Take note that when placed in an air-tight container for storage, place them in a single layer, do not stack them up, as they sticks to each other! And would not look pretty once you remove them! We really enjoyed eating these Whoopie Pies, the cookie-cake is really soft, moist and fluffy. The minty buttercream is a delight and put them together, you would not stop at just one! Let's visit my baking buddies, Lena from Frozen Wings and Zoe from Bake For Happy Kids and all our baking friends who has baked along with us in the linky below. For our next bake, we will be baking Everyday Yoghurt Cake from Cake Keeper Cakes by Lauren Chattman, page 50 or you may get the recipe here. The linky will start on 12th Sept right up to 18th Sept. Do join us, everyone's welcome. Position rack in center of oven and preheat to 375F. Line 2 large rimmed baking sheets with parchment paper. Sift flour, cocoa powder, baking powder, and baking soda into medium bowl. Using electric mixer, beat shortening (or butter), sugar, egg yolks and vanilla in large bowl until well blended, about 2 minutes. Add flour mixture in 3 additions alternately with milk in 2 additions, beating well until blended after each addition. Drop dough by very rounded tablespoonfuls onto prepared baking sheets, spacing 3 inches apart. Bake 1 sheet at a time until cookies are slightly puffed and spread but are still soft, 8 to 10 minutes. Cool on sheets 10 minutes. Carefully transfer cookies to racks and cool completely. Repeat with remaining cookie dough. DO AHEAD : Cookies can be made 1 day ahead. Store airtight in single layer at room temperature. Using electric mixer, beat shortening (or butter), peppermint extract, and vanilla in large metal bowl until blended. Add powdered sugar, egg whites, and pinch of salt, beat until light and fluffy. Add food colouring drop by drop for desired shade of green; beat until well blended. If mixture looks curdled, place bowl over low heat several seconds and beat until smooth. Repeat as necessary until smooth. Spoon mint filling into pastry bag fitted with medium star tip (or spoon filling into resealable plastic bag, squeezing filling into 1 corner of bag, then cut off 1/4 inch of plastic bag corner to allow for piping). Starting at outer edge of bottom (flat side) of one half cookies and working toward center, pipe mint filling in spiral. Place one half cookie over mint-filled cookie and pressing slightly to adhere. DO AHEAD : Can be made 2 hours ahead. Store airtight at room temperature. Some of you may ask, "Belimbing? What is that?" If you are from Malaysia, you may or may not know what Belimbing is. Even though it can be found locally, not many Malaysian would know of this fruit. It is an extremely sour fruit, that is used mainly in cooking, and is popular among the Nyonyas and Malays in Melaka and certain states in Malaysia. Belimbing tree can hardly be found in Kuala Lumpur and Selangor city where I lived. Mostly, these trees can be found in villages and smaller towns. I was fortunate enough to have one right in my own backyard! Yes, I planted this Belimbing Tree about 12 years ago from the seeds of a ripe fruit. It has been faithfully fruiting regularly all these years. The fruit is long and oval, green when young and will turn yellow when ripe. They are at their best when the fruits are green and young, once they turn yellow, they will get all mushy and soft. And these fruits are extremely sour, they do not turn sweet when ripen, they are sour throughout. Belimbing Tree at my small little backyard. The tree is about 20 feet high. The pretty red flowers that will produce wonderful, sour fruits! Belimbing fruits. They grow along the branches and the stems that holds them together are extremely fragile. Just nudge with a slight force, and the whole bunch of fruits would drop to the ground. Are you familiar with Belimbing fruits? The fruits are delicious when pickled! Very addictive! You may not have noticed it, but a similar photo of these fruits, is the profile picture of Kitchen Flavours. In fact, the very first post of Kitchen Flavours was about this tree! This Belimbing Fruit Tree is very precious to me! :) I have fond memories of my beloved late mom cooking delicious spicy dishes using these fruits during my childhood days in Melaka. I used the fruits for cooking sambal dishes like the one below, in asam pedas which is very popular in Melaka, and I love them pickled, maybe one day, I'll do a post on that! 1.Belimbing fruits and kaffir lime leaves, both from my garden. 2. Make a few tears by the side of the kaffir lime leaves right before cooking, the wonderful aroma of the leaves will be released even better. 3. Some of the ingredients, belimbing fruits, kaffir lime leaves, sliced onions, tomato wedges. For the cooking instructions, refer to my recipe below. A plate of Sambal Belimbing Prawns is ready for your tummy! We love to eat the belimbing, even my kids love the fruits. Even though this dish might be a little spicy for them, they would dig for the prawns and the belimbing, brush aside the gravy and eat with rice. Once the fruits are cooked, they will release the sourness right into the gravy, so the fruits are really not that sour after cooking. Usually for sambal dishes like this, some tamarind paste dissolved in water would be used, but I have omitted that, as the belimbing is sour enough. Does it look spicy to you? Do you like spicy food? Cut dried chillies lengthwise to remove as much seeds as possible. Rinse them clean and place in a small pot, covered with cover and let it come to a boil. Let it boil, uncovered for 5 minutes. 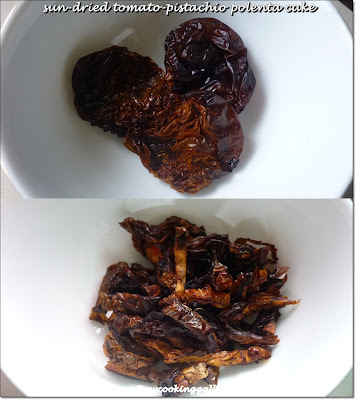 Turn off heat, let dried chillies soaked in hot water for about 10 minutes, then drain,. wash under cold tap water in a strainer, then leave to dry for about 15 minutes. Blend the softened dry chillies, shallots, garlic and belacan (shrimp paste) together to a fine paste. Marinate the shelled prawns with 1 tsp of sugar, stir well to combine. Keep aside. Heat oil in wok or saucepan. Add the blended paste and fry for about 8-10 minutes over medium-low heat, stirring frequently to avoid burning, add in kaffir lime leaves into the 5 minutes of frying, and keep stirring until paste is fragrant and separates from the oil. Add in belimbing fruits and keep stirring for about 1-2 minutes. Add about 1/4 cup of water, stir, let it come to a simmer, stir for about 2 minutes to soften the belimbing, you may taste the sambal at this point, if it is not enough sour for you, some belimbing may be added. Then add in the prawns, tomato and salt to taste. A pinch of sugar may be added if you want a sweeter sambal. Let it boil and stir until prawns are cooked through, about 5 minutes. Dish out to a serving plate and serve with plain white rice. Enjoy! Wanna join me at the beach? Well, hop on over to I Heart Cooking Clubs (IHCC) where we are heading to the beach for some fun and of course, we are bringing something delicious, made and inspired from Rick Bayless's recipes. Our theme for this week is "Beach Bum". Weather is pretty crazy these last few weeks, there's no rain for almost three weeks, it is extremely hot and heading to the beach to cool off is a pretty tempting idea! Would you like a glass of this cool, refreshing watermelon cooler? This is so refreshing and yummy! I'm drinking this, picturing myself on a beautiful sandy beach, lounging on a comfortable beach lounge chair with a big giant top umbrella to keep off the sun, overlooking the calm blue sea, with the breeze blowing, without a thought to anything, except to just enjoy the moment, while slurping this lovely Fresh Melon Cooler, with a big cool jug right on the beach table next to me. And a plate of crispy cheezy Tortillas chips! Such bliss! And, Rick Bayless is somewhere nearby, preparing some delicious lip-smacking Mexican barbecue, and myself eagerly waiting, to savour and satisfy my hungry tummy! hahahaha!! Gosh! Dream on! (but, secretly wishing it will come true!) HAHAHAHA!! To view what the others are bringing to the beach, please check it out at I Heart Cooking Clubs (IHCC) where we are cooking from Rick Bayless's recipes until 30th September. Scoop the fruit into a blender, then add the water, sugar and lime. Blend until smooth. Add more water, if necessary, to achieve a light, easy-to-drink consistency. Taste and season with more sugar and lime if you think necessary. You can add extra flavorings (mint to honeydew, orange juice to cantaloupe, and blended raspberries to watermelon) if you like. Refrigerate to chill or serve over ice. We went to the beach today! Port Dickson, about 1-1/2 hours drive from where we live. Had a few hours of fun, unfortunately without my Fresh Melon Cooler, and Rick Bayless oceans away!! A simple chicken stir-fry dish. Quick, easy and perfect as a main dish with rice! I was actually looking for a quick dish to prepare for dinner, as I had some errands to do in the late afternoon which would take me a couple of hours. So I browsed through a copy of stir-fry cookbook and decided on this easy dish. I marinated the chicken and left it in the fridge, covered, went out to do my errands and came back about 3 hours later, and cooked this easy dish. Make sure you take out the marinated chicken from the fridge about 20 minutes before cooking. This dish uses very few ingredients. Of course, as usual, I doubled up on the amount of spring onions! :) The chicken are really tender since they are marinated with the cornflour and other ingredients for 3 whole hours. This dish is good with plain white rice, and I'm sure if you are serving this to kids, they will love it. The original version uses turkey meat and addition of cashew nuts, but I've simplified it with some changes. To make the marinade, mix the cornstarch and rice wine to a paste. Add the pepper, salt, egg white, and sesame oil, mixing well. Put the chicken in a shallow dish, and add the marinade, turning to coat well. Let stand for 30 minutes. (I left the marinated chicken in the fridge for three hours). Heat a wok, preferably nonstick, over a high heat, then add 3 tablespoons of the oil. Add the garlic and white parts of the scallions, and stir for a few seconds to flavour the oil. Add the chicken and reduce the heat slightly. Stir-fry for a couple of minutes, until chicken turns light brown on both sides. Sprinkle with the rice wine. Transfer to a plate with a slotted spoon. Increase heat to high, then add the remaining oil. Swirl the oil around the wok, then stir in the hoisin sauce. Return the chicken mixture to the wok and stir-fry for 2-3 minutes, turning to coat, until cooked through. Add the green parts of the scallion. Transfer to a warmed serving dish, and serve immediately. For this month, Bake Your Own Bread (BYOB) has featured Hefe und mehr as the featured blog of the month, a lovely site with tons of bread recipes, I had a hard time selecting which one I'll make because there are so many that I want to bake! 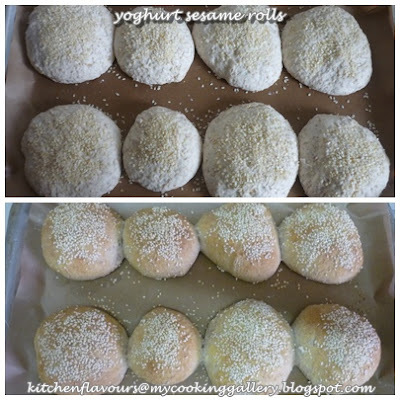 There are a few that I've bookmarked, but I kept coming back to this particular rolls, Yoghurt and Sesame Rolls. Firstly I have made a bread with yoghurt used in the starter before, and I like it very much, and secondly, I love breads with sesame seeds on the top! I can imagine the fragrance of the sesame seeds. So, Yoghurt and Sesame Rolls it is! I have made a few changes, simply to adapt to what I have on hand. There is always at least a jar of homemade yoghurt in my fridge, so perfect for these rolls. Stefanie from Hefe und mehr has used fresh yeast and freshly milled wheat, and since I do not have either of these, I use instant yeast and wholewheat flour instead. I mixed this the night before. 2. Mix the instant yeast into the yoghurt in a large bowl. I left it for about 10 minutes. 3. Add in the wholewheat flour, bread flour and salt. Mix well. 1. Mix until dough is homogenous, it will be very sticky. Cover with cling wrap and leave at room temperature overnight. 2. The next morning, the dough has risen, but it is really sticky. It smells sour, but a lovely sour scent. 3. I tried to roll it out to 40cm square, as per the original instruction, even with a sprinkling of flour on top, it remains very sticky. The dough are supposed to be folded to a 20cm square and cut to nine squares before baking. Since I am unable to fold because of the stickiness, I divide the dough into 8 sections and made them into round rolls instead. These rolls are not exactly round, when I placed them on the baking tray, they sort of go out of shape, as the dough is soft. I have to flour my hands really well, as the dough is sticky. Scatter some sesame seeds over top, pressing them down gently. Leave to rise for about 40 minutes and bake in a preheated oven a 250C for 18 minutes, I baked mine at 230C for 21 minutes. It smells really nice while baking. Immediately remove rolls from tray and place on a wire rack to cool. About 20 minutes after baking, I ate the first roll. The crust is so crispy and the interior are soft and moist, with a sourish and tart taste of the yoghurt, just as Stefanie described. I love the crispy crust and the wonderful smell from the sesame. I had another one with a bowl of hot mushroom soup for a simple light lunch. Though I would prefer if these rolls are little bit less sour, nevertheless, I did enjoyed these rolls! I had one more later as a teatime snack with a generous spread of salted butter and a mug of hot sweet black coffee! Thanks to Stefanie of Here und mehr! The recipe below is based on the changes that I've made. For the original version, please refer to Here und mehr. The night before : Mix yoghurt and instant yeast in a large bowl, let stand 10 minutes. Add in flour, wholewheat flour and salt, mix to a homogenous dough. Cover with cling wrap and leave to ferment overnight at room temperature. The next morning : Turn dough onto a well-floured work surface. Divide dough into 8 parts, roll each part with well-floured hands to form a ball. Place on lined baking sheet. Sprinkle some sesame seeds over the top, pressing down slightly. Cover with kitchen towel and leave to rise for about 40 minutes. Preheat oven to 230F. Bake for about 20 minutes until golden brown. Remove rolls to a wire rack to cool. Cincaluk is a special fermented shrimp delicacy of the "Nyonyas of Melaka". This is really an acquired taste, if you are a true Nyonya, the mention of Cincaluk will make your saliva glands working overtime! Haha! I'm exaggerating? Mention Cincaluk to the Babas and Nyonyas, and see how their face lit up with a smile, like mine!! Being a Nyonya myself, I grew up eating this delicacy and we never get tired of it. My beloved late mom used to make our own Cincaluk at home, with a little brandy mixed in. The store-bought ones do not contain liquor and usually way too salty, nothing beats homemade! Babas and Nyonya are the descendants of the 15th and 16th-century of the Chinese immigrants to Malaya during the Colonial era. They are also known as Peranakan or Straits-Born Chinese as most have lived for generations along the Straits of Malacca. If you are interested to know more about Baba (the gentlemen) and Nyonya (the ladies), you may get some information from here, here or just google for more info. Most Malaysians would be familiar with this delicacy, especially if you have visited Malacca before, you would see bottles of Cincaluk, in the supermarkets, road-side stalls and practically in every shops that sells food stuffs. They can even be found in all parts of Malaysia in any supermarkets. Cincaluk can be eaten as it is with the addition of sliced chili, shallots and a squeeze of lime, or used in cooking. Here, I have used it in the most simplest way, Telur Dal Cincaluk (Cincaluk Omelette). Cincaluk is made up of raw geragau (small tiny shrimps), cold cooked rice and salt. These are mixed and left to ferment for a few days before they are ready to be eaten. Cincaluk may not look very appetizing, it really is an acquired taste. Either you love it, or you would want to keep away from it! Cincaluk are usually very salty, so for making my omelette with 4 large eggs, I only use 1 tablespoon of Cincaluk, without any addition of salt to the eggs. Drain the Cincaluk and use the back of the spoon to press out the brine. Discard the brine, it is very salty. If more Cincaluk is preferred, then it is advisable to rinse the Cincaluk with some warm water to discard most of the saltiness. Beat eggs with a dash of white pepper powder. Stir in the cincaluk, mix well. Meanwhile, heat up a non-stick saucepan with 2 tablespoons cooking oil. Saute the sliced onions and chilli about 2 minutes until onions are softened slightly. Pour in the egg and Cincaluk mixture, cook over low heat until golden brown, turn omelette over and cook other side until golden brown. Turn out to a serving plate and serve with hot plain white rice. This is also great with plain white rice porridge. A plate of Telur Dal Cincaluk, A Nyonya Dish. In some Nyonya cookbooks, Omelette is known as Telur Dadar, which is actually the Malay term for Omelette, but in my Nyonya household, Omelette is known as Telur Goreng Dal, or simply, Telur Dal. Are you a Nyonya, what do you call Omelette in your house? To translate : Telur (eggs), Goreng (Fried), Dal (Omelette). My favourite way of eating Cincaluk, as a condiment to fried fish, fried eggs, eaten with plain white rice. Cincaluk with Shallots, Birds' Eyes Chilli and Lime Juice. Drain cincaluk and use the back of the spoon, press out excess brine from the Cincaluk. Discard brine. Beat eggs in medium bowl with a dash of white pepper powder. Add Cincaluk and mix with a fork to evenly combine. There is no need to add any salt to the eggs, as the Cincaluk is salty enough. Heat oil in a non-stick saucepan. Saute the onions and chillis for about 2 minutes until the onions turn limp or softened slightly. Add in the egg and Cincaluk mixture. Cook over low heat until the bottom of omelette is golden brown, turn over and cook until the other side is golden brown.